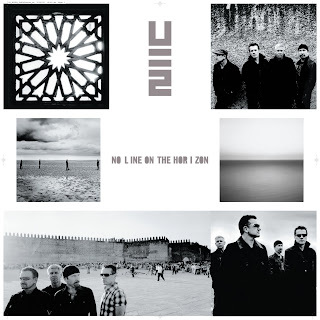 Discussions Magazine Music Blog: U2 "No Line On The Horizon"
Go to any CIMS MUSIC COALITION STORE and get a FREE Limited Edition U2 lithograph (pictured above) with purchase of the new release. Promotion starts on March 3rd. Hurry, while supplies last! U2 got me right away with this new album with 'Get On Your Boots'. I just got the album on March 4th and I have played it three times already. It is an album that grows on you. There are discussions on IrishIndependent.ie about it where people are being too detailed about the past albums and this one. Hey everyone, let the music do the talking! Now, I need to get new boots to wear to their concert when they come in town!